Note: Please refer to the User Manual before use .If any problem/question, please kindly contact us firstly. 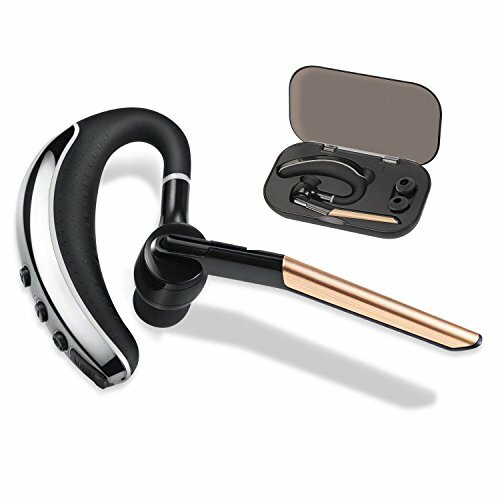 Waterproof anti sweat design,Built-in intelligent voice prompts.The 180 degree flip-boom arm and 270 degrees swivels boom allows you to adjust the angle and fit your right ear or left ear,you can wear comfort all day .Separate mute switch and volume buttons and MFB buttons make it easy to access and control hands-free calling. -Compatible with iPhone and iOS/Android cell Phone and almost all smartphones, tablet, laptop, music player etc. 【Unsurpassed Audio】This bluetooth phone headset is equipped with a CSR chip and APTX, ensuring maximum signal quality, and guaranteeing outstanding sound quality.Allows you to enjoy high quality music and clear phone calls wherever. 【Comfortable and Convenient 】Our bluetooth earpiece for cell phone is equipped with 180 degrees flip-boom arm and 270 degrees swivels boom, Lightweight design and 3 different sized ear plugs,fits 99.9% sizes of people's ears,apply to both left and right ears to wear all day. Extra high-end carrying case protects the headset from damaging and losing. 【Smart Features】Our hands free Bluetooth headset for cell phone supports Siri/Google voice assistant and mute button.And you can pair and connect your earphone to 2 different smartphones or any two Bluetooth-enabled devicessimultaneously. Long-lasting battery offers up to 6.5 hours talktime and up to 180 hours in standby mode with single 1.5 hours quick charge. If you have any questions about this product by AreUok, contact us by completing and submitting the form below. If you are looking for a specif part number, please include it with your message.